Morocco's government is threatening to take control of U.N.-monitored buffer zones in Western Sahara amid concerns that the mission is failing to keep out Polisario Front independence fighters. The warning Sunday came as U.N. Security Council members received Secretary-General Antonio Guterres' annual report on the situation in Western Sahara and the 27-year-old U.N. peacekeeping mission in the mineral-rich territory claimed by both Morocco and the Polisario. "If the U.N., its secretary-general and the Security Council are not ready to put an end to these provocations, Morocco will have to act out its responsibility and intervene in the buffer zones," Bourita told reporters after an emergency parliament session to address Western Sahara. U.N. spokesman Stephane Dujarric told reporters Monday that members of the U.N. peacekeeping mission, known as MINURSO, "have not observed any movement of military elements in the northeast territory." "MINURSO continues to monitor the situation closely," he added. Interior Minister Abdelouafi Laftit said, "Morocco is ready to do everything to preserve its Sahara." Peru's U.N. ambassador, Gustavo Meza-Cuadra, the current council president, told reporters Monday that he received a letter from Morocco's U.N. ambassador that has been circulated to the 15 council members. He called it an "informative letter" and said "no action has been taken yet." Morocco annexed Western Sahara, a former Spanish colony, in 1975 and fought the independence-seeking Polisario Front. The U.N. brokered a cease-fire in 1991 and established a peacekeeping mission to monitor it and to help prepare a referendum on the territory's future that has never taken place. 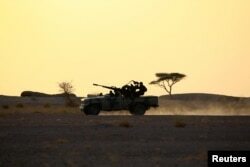 FILE - The Polisario Front soldiers drive a pick-up truck mounted with an anti-aircraft weapon during sunset in Bir Lahlou, Western Sahara, Sept. 9, 2016. In a report to the Security Council obtained Monday by The Associated Press, Guterres called on the Polisario Front to withdraw from Guerguerat. And he urged Morocco to reconsider its refusal to send an expert mission as part of the U.N.'s effort to address questions raised by the Guerguerat situation. "I call on both parties to exercise maximum restraint and to avoid escalating tensions, and to refrain from taking any action which may constitute a change in the status quo at the buffer strip," Guterres said. Kohler has sought to broaden the discussions on the territory's future. The Saharans' envoy to Algeria, Abdelghafour, said Polisario members in the buffer zones are under surveillance by U.N. forces, and accused Morocco of violating the cease-fire. "Morocco is threatening everything," he told The Associated Press. "It's obvious that these maneuvers are aimed at influencing the next U.N. Security Council meeting to stop it from taking practical, effective measures." Guterres said the area remained free from supporters of either side until January, when the Polisario Front established what its leaders described as a daylight-hour "monitoring post" manned by a small group of its "unarmed civilian 'police.'" The secretary-general said the post has remained. Also in 2016, Morocco expelled over 70 people working for the U.N. mission in Western Sahara, known as MINURSO, after then-U.N. Secretary General Ban Ki-moon used the word "occupation" in talking about Western Sahara. Guterres recommended that the Security Council extend MINURSO's mandate until April 30, 2019. "The conflict over Western Sahara has lasted for too long and must be brought to an end for the dignity of the population ... including those who have been displaced for more than four decades, as well as for the stability of the wider region, which is facing myriad political, economic and security challenges," he said.